A vengeful psychotic serial killer to offer sweets to your guests! 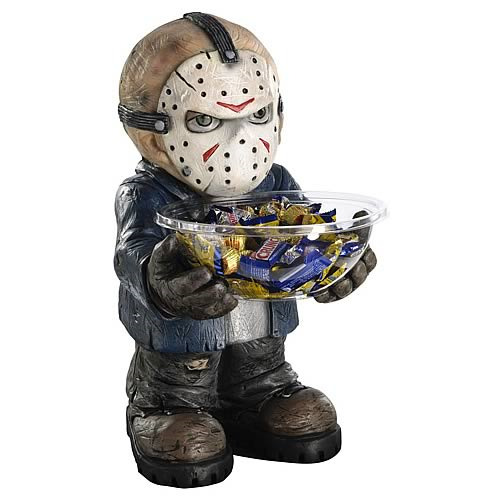 The Jason Voorhees Candy Bowl Holder measures 20-inches tall. Features Friday the 13th movie-accurate detailing! Care for some candy? You might want to think twice about that! What could be better than a vengeful psychotic serial killer like Jason Voorhees to offer your sweet treats to strangers and welcome visitors alike? This somewhat intimidating Friday the 13th Jason Voorhees Candy Bowl Holder measures 20-inches tall x 11-inches wide x 8-inches long. It features excellent detailing - like the painted cracks on his mask, indented wrinkles on his brown boots, and a blue jacket - that make Jason movie accurate to the iconic Friday the 13th film. If you like those slasher flicks or would just love having a totally unique eye-catcher in your kitchen or entryway, order the Friday the 13th Jason Voorhees Candy Bowl Holder! Includes candy bowl, too. Ages 17 and up.